Just as the evolution from vacuum tubes to transistors changed the test equipment (TE) landscape in the 1970s with drastic decreases in physical size, ruggedness, price, functionality, portability, bandwidth, and power consumption, today's products move ahead at an equal or even greater pace. Microprocessors make possible programmability and reconfigurability, mathematical signal processing, LCD displays, high speed interconnectability, data storage, automation, and intuitive user interfaces. Surface mount components and other advanced production methods, super high bandwidth semiconductors, advanced filter construction, and light weight, rugged packaging have resulted in an amazing selection of special-purpose and multi-purpose test equipment. 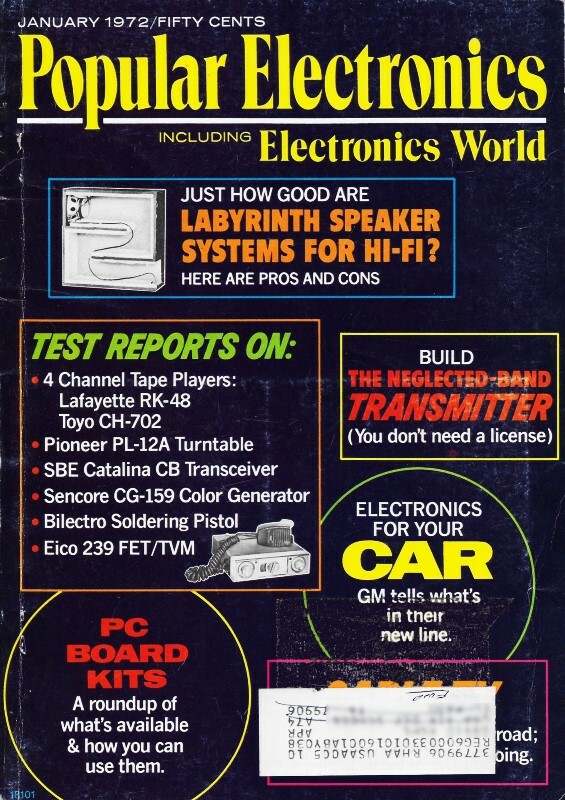 This 1972 Popular Electronics article gushed over the relatively recent advent of triggered sweep oscilloscopes priced in a range accessible to hobbyists and small electronics shops. Then, as now, a lot of the lower cost TE was being supplied by newcomers - often from foreign manufacturers. Major test equipment manufacturers were starting to feel the pinch as brands like Rohde & Schwarz, LeCroy, and Yokogawa began appearing on lab benches next to Hewlett Packard and Tektronix. Test equipment manufacturers are "coming alive" at a remarkable rate and the biggest change next to new lines of sweep-marker and color-bar generators is an entire bevy of triggered sweep oscilloscopes. Following the "biggies" lead - Tektronix and Hewlett Packard - with their very expensive but highly accurate and durable equipment, such foreign and domestic companies as Telequipment, Leader, Sencore, B & K, Lectrotech, Heath, EICO, and others are now preparing to offer, or are offering, brand new DC amplifier triggered oscilloscopes that range in price from just over $300 to $975. Comes the Evolution. 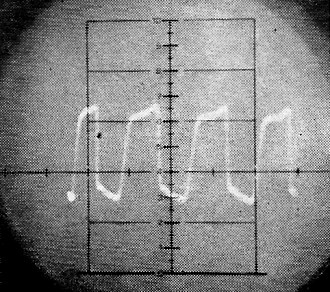 Most of us hardly saw an oscilloscope before the very late 1940's, or early '50's, and those we did see weren't exactly instruments as we know them today. Bandpasses were in the kilohertz range, as were X-axis sweeps, and hot vacuum tubes often made a blower fan necessary in the big units. Lower priced equipments were all ac-coupled and recurrent sweep types, with as few tubes as possible to keep down costs; and their linearity was often questionable. Since that time, there have certainly been refinements in these economical models, such as extended 5-MHz or 10-MHz bandwidths, recurrent sweep ranges to 500 kilohertz, perhaps dc amplifiers, and flat-faced cathode ray tubes. And these scopes are fine for general peak-to-peak voltage measurements and medium-to-low frequency waveform displays. But generally, many have not matured as have their more expensive brethren: once again, because of costs. There are still under $108-plus kit and $170-up factory-built oscilloscopes to be had, but you'll naturally have to make some allowances; because perfection forever costs money - all the way to thousands for the best. Three Basic Uses of an Oscilloscope. Fig. 1 - Shows measurement of peak-to-peak AC. Fig. 2 - DC voltage levels. Fig. 3 - Frequency measurements. What Is a Triggered Sweep? First, let us take a close look at a recurrent (non-triggered) sweep scope. Its sweep circuit consists of a selected timing capacitor charging up from a voltage source, and discharging through a tube or transistor. Because the charging curve of a capacitor is linear for only a short period, if the applied charging voltage is not on the head, the nonlinear portion of the charging curve is also included in the sweep. This same state of affairs can occur when you try to use a single capacitor over too wide a charging time to cover too much of a sweep range. A recurrent sweep scope can be synced to a waveform, but because of wider manufacturing tolerances in low-priced instruments and the use of unregulated power supplies, the point where the timing capacitor starts and stops its operation may wander about a bit. Also, with a varying input signal, the scope sync circuit may have a little "play" so you have to expect some jitter in the trace. What does a triggered sweep scope have that others do not? To start with, it usually uses some form of "lockout circuit" that unhitches the sweep circuit from the sync so that after the first toggle on, nothing coming in on the vertical channel can affect the stability of that particular sweep. This approach "clumps" the effect of variable sync due to noise and signal variations. Then, a triggered sweep scope uses only one selected capacitor for a limited range, and operates this capacitor well within its linear range. Also, most triggered sweep scopes use some form of well regulated power supply. All this costs money, and that is why they are more expensive than recurrent types. What we'll do is supply a working introduction to a dual-trace triggered sweep oscilloscope, including a recurrent sweep scope for comparison. Three Uses For An Oscilloscope. Let's start with the three basic uses of an oscilloscope. You can use it for peak-to-peak ac voltage measurements (Fig. 1); dc voltage measurements (Fig. 2); and time base-frequency measurements (Fig. 3). And the interesting part is that you can do all these things simultaneously. For instance the waveform in Fig 1 is simply a differentiated square wave. The vertical attenuator on the oscilloscope is set for 0.5 volt per division, but there is a 10X capacitance (LC) probe attached, so we move the decimal forward one place, and that makes each division worth 5 volts. Therefore, total peak-to-peak amplitude (height) of the waveform is 22 volts. In Fig. 2, let's say that each division is worth 10 volts, and we'll establish a de reference with the lower trace on the first (bottom) horizontal line of the graticule. So, if the voltage rises five divisions when the circuit is active, this means we're looking at a well-filtered power supply of 50 volts. Time Base Measurements. Here, we'll use an exact function generator and different waveforms to illustrate what a triggered scope's accurately calibrated time base does. Let's set the upper channel for triangular waveforms and the lower channel for pulse waveforms (Fig. 3). Naturally, since the same time base is driving both, they're at the same repetition rate. If you'd like to check the accuracy of both the oscilloscope and any calibrated generator you might be using, step up or down repetition rates so that just one division contains a complete cycle. In this instance (Fig. 3) we went to 0.1 millisecond per division on the scope's time base, and found, to our satisfaction that since F = 1/T = 1/0.1 x 10-3 = 10 kHz. Note that the lower trace of Fig. 3 is a symmetrical, rectangular waveform with a 50% duty cycle, and this makes it a square wave. The upper trace is a sawtooth that is not quite linear at the top tip. Of course, while we're discussing oscilloscopes we're doing some waveform analysis that will be one of our more specific subjects in the future when we talk about graphic display instruments and their use. An AC Recurrent Sweep Scope. To give an idea of what you might come across in the lowest priced equipment, let's do some waveform comparisons following a short explanation of what to expect. The recurrent sweep scope has a calibrated vertical amplifier that's as linear (current and voltage proportional) as the manufacturer can make it, for the price. Usually there's no dc amplifier, because these have to be especially biased and compensated and are more expensive to make. Then, of course, there's no triggered sweep for time base measurements. So what you have is a peak-to-peak ac voltage indicator and a gross frequency horizontal sweep that's broadly readable from about 5 Hz to 100 or 500 kilohertz divided into X10 increments, with variable dc potentiometer tuning in between. And you must cope with a low frequency tilt. 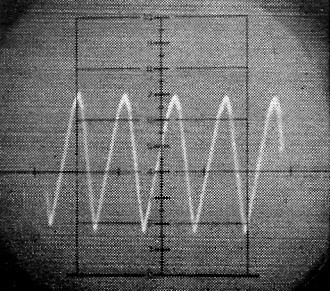 Waveforms Shown on a Less Expensive Scope. Figure 4 - The top of Fig. 3. Fig. 5 - The bottom of Fig. 3. Fig. 6 - The same thing at lower frequency. 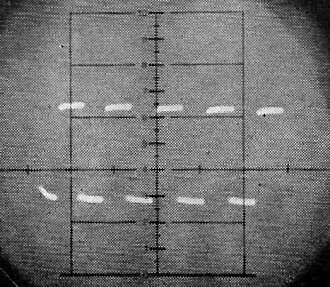 Waveforms of An Inexpensive AC Scope. To illustrate what we've been talking about - at possibly, the most modest of levels - let's show the kind of responses that may be forthcoming if you select a real cheapie. Naturally, the better ac and the dc scopes do a more acceptable job than we'll show here - and this just might be a suggestion to evaluate before you buy. Fig. 4 is simply the top of Fig. 3 at the same frequency of 10 kilohertz, repeated on an uncalibrated X-axis of a recurrent sweep scope. 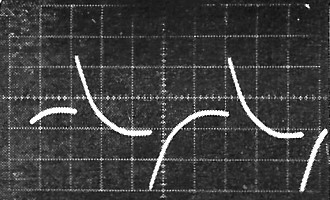 Notice that the trace is thicker - has a much larger spot size, begins somewhat nonlinearly, and is somewhat out of calibration since the more expensive triggered scope measures 4.4 volts p-p, while this one (at 1 volt per minor division) is almost 5.4 volts - enough to make a substantial measurement difference in small-signal transistor circuits. Observe also that the trace thickens toward the right indicating poor stigmatism and focus circuits or adjustments, since they're interactive. We'll switch now to the bottom waveform originally produced in Fig. 3 but reduce the repetition rate to 100 Hz as shown in Fig. 5. Here the rounding and tilted low frequency response becomes evident and the recurrent sweep seems to be somewhat other than linear since the duration of the initial left half cycle is less than the others. Vertical amplitude should be about 3 volts, and it indicates just over 4. Of course, this can be adjusted. Let's go to a 1-MHz repetition rate. The recurrent scope won't hold frequency. So we'll drop down to 900 kHz and see what's cooking. 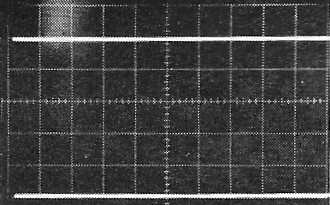 Figure 6 shows the results, somewhat more plainly this time than at either 100 Hz or 10 kHz. The tilt again shows lack of low frequency response. 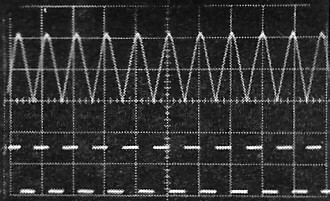 The sloppy rise and fall times of each half cycle either indicate a poor generator - and this one isn't - or poor vertical rise and fall times in the oscilloscope's own amplifiers. The left initial trace is now quite nonlinear, although the Fig. 5 and Fig. 6 amplitudes remain the same. The tops of the 900-kHz pulses should be as flat as pancakes. This, of course, is why good pulse or square waves are usually used to check visual test equipment and all sorts of amplifiers. In the square wave, low frequency information is on the top of the waveform, and the intermediate and high frequency information is on the sides. Therefore, the more harmonics in any square wave, the steeper are its sides, and the more expensive visual instrument it takes to judge them correctly. Final Considerations. Now, triggered or recurrent, take your pick, but look and ponder before that precious buck flies out the window. A little investigating can tell so much - especially with a good square wave generator. If your decision is ac routine, you spend (for a ready-built) from $180 to $250; for dc deluxe or triggered sweep with single trace, the tag will be $340 to $450; and if you're considering dual trace, 5 or 10 millivolts sensitivity, and low nanosecond sweep speeds, $500 to $600 is the price you'll pay plus about $25 to $30 each for good probes. (Prices for scope kits in the intermediate range where available, are, of course, much lower.) But whatever you have or buy, learn to use it well - for an oscilloscope is every electronics man's best friend.